I successfully completed Phase II of the Fat Smash Diet, and am hoping that some of you have joined me on this mission. Since many of the Weight Watchers recipes are suitable for Phase III of the Fat Smash Diet, I am sharing some of the ones I tested and loved. 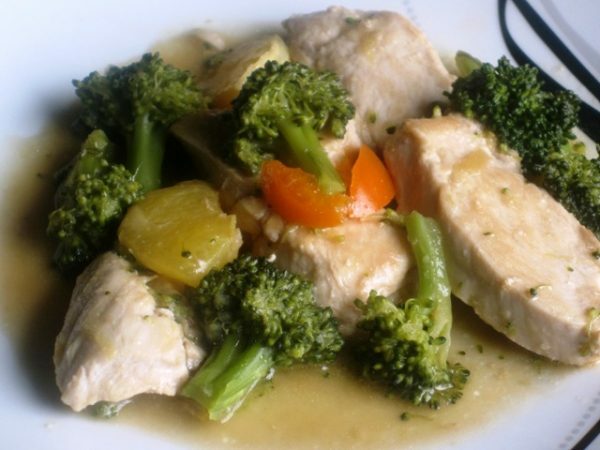 Today’s post for the Orange Chicken with Broccoli is also a very lean dish, delicious and simple to prepare. I enjoyed this dish with brown rice and veggies, since potatoes and white rice are excluded from the Fat Smash Diet. Heat oil over medium heat in a nonstick medium saucepan. Add the chicken strips, and saute 2 minutes on each side. Add the ginger and garlic, and cook 1 minute longer. Transfer chicken in to a plate, cover, and set aside. Add water and broccoli to the sauce pan, cover and simmer for 3 minutes. Stirring at least once. In a small bowl, mix the orange juice, broth and soy sauce. Return chicken to the saucepan, stir in orange juice mixture. Dissolve the corn starch with 1Tbs. of water, and add to saucepan. Bring to boil, lower heat and simmer until thickened, folding gently to coat the veggies and meat. Add orange slices, and serve.